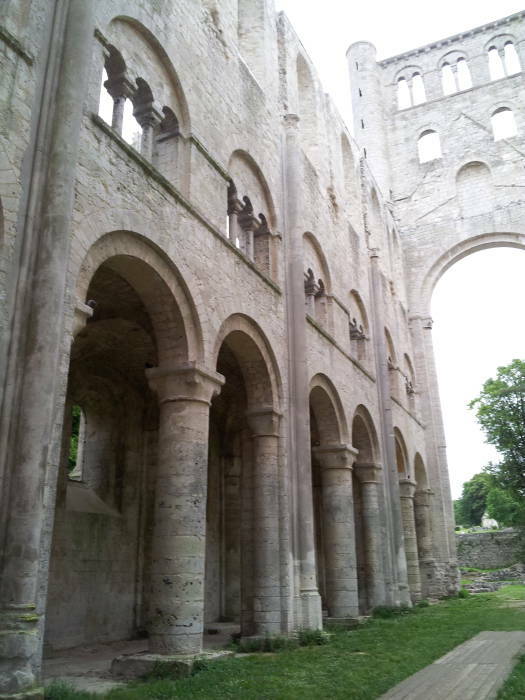 Jumièges Abbey is the earliest and greatest of the Norman abbeys. 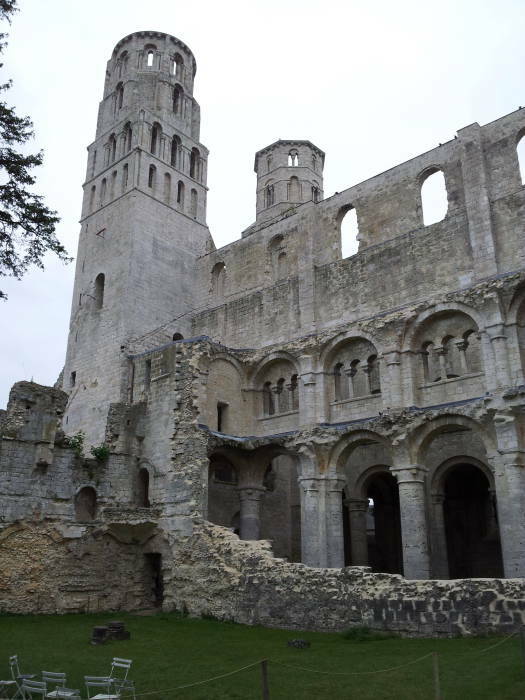 It was founded in the 7th century and it rose to become the peak of Norman monasticism in the Seine river valley. It survived a sacking by the earliest Norse invaders, flourished under later Norman support, and ultimately fell victim to assaults first by other Christians and finally by the French Revolution. The abbey began to prosper in the 10th century under Vilhjálmr Langaspjót, known in French as Guillame Longue-Epée, or in English as William Longsword. He was the son of the Norse leader Hrólfr, who known in the Latin chronicles as Rollo. William followed Rollo to become the second count of Rouen and ruler of Normandy. 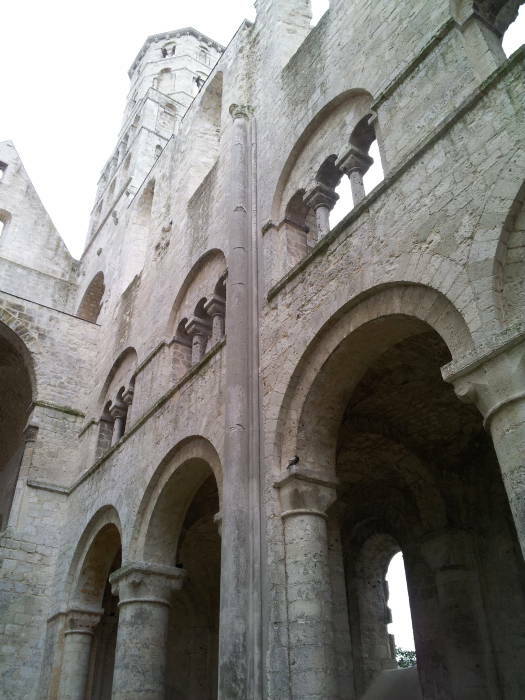 Jumièges Abbey reached its high point during the centuries that Normandy was run by the Normans who were only nominally subjects of the Kings of France. It changed hands back and forth between the English and French during the Hundred Years' War, which really lasted for 116 years from 1337 to 1453. The Huguenots destroyed the abbey and its library and archives during the Wars of Religion in 1562. The abbey never really recovered. After the French Revolution it was left in ruins, used as a stone quarry providing building material for local construction projects. The Seine river rises near Dijon, flows through Paris, and continues through Normandy on its 777-kilometre journey to the sea. 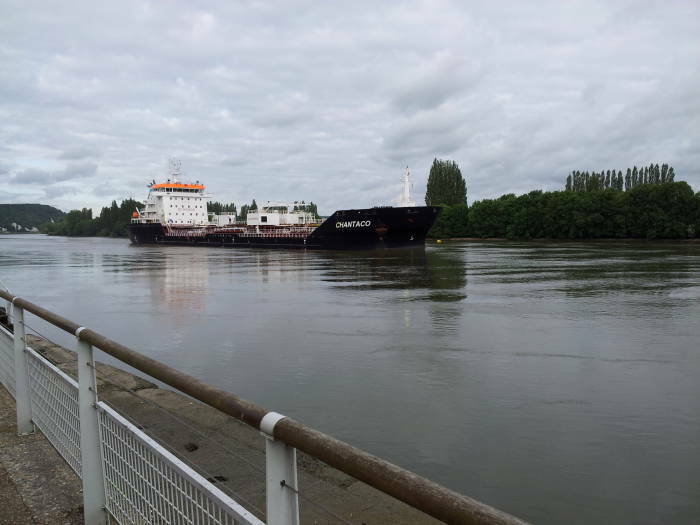 It is navigable by ocean-going ships as far upstream as Rouen. It drops just 24 metres over its last 446 kilometres, keeping its flow slow and navigable. That leads to a serpentine path with many loops, called boucles or méandres in French, as seen on the maps above and below. Map of Normandy, US Army map NM-30-31 Perry-Castañeda Map Collection at the University of Texas at Austin. 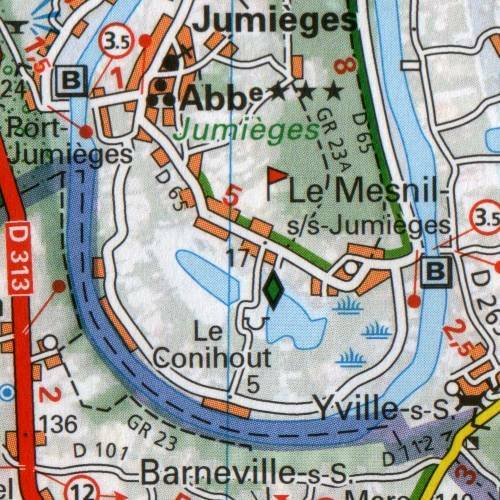 We are headed for Jumièges Abbey within a loop of the Seine west of Rouen, as seen on the map below. 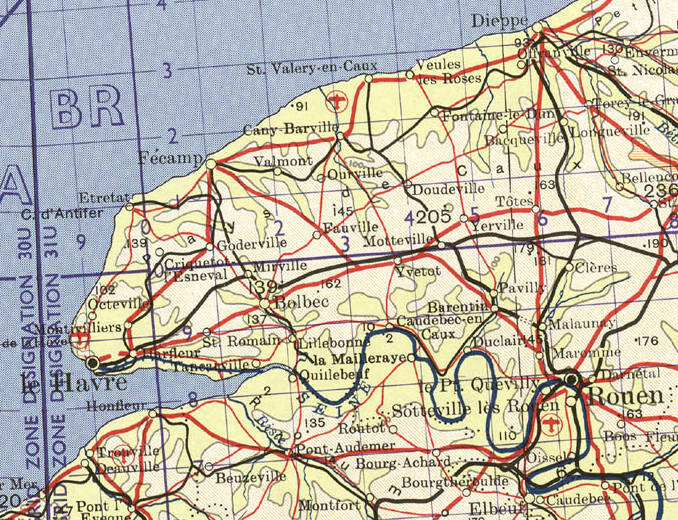 We leave Rouen to the west on the two-lane highway D 982 (formerly road 182 as marked on this map from 1953). The road ascends through a series of switchbacks as we leave the west edge of Rouen and the road climbs to an elevation of about 130 metres as it passes through a forest west of Canteleu. We then descend through more switchbacks to pass the abbey of Saint Martin-de-Boscherville, following the north bank of the Seine through Duclair. 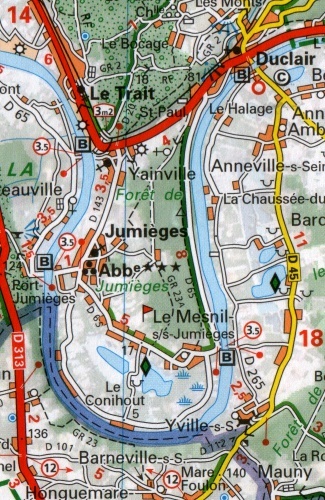 Jumièges is in the Seine river loop south of the next segment of highway west of Duclair. 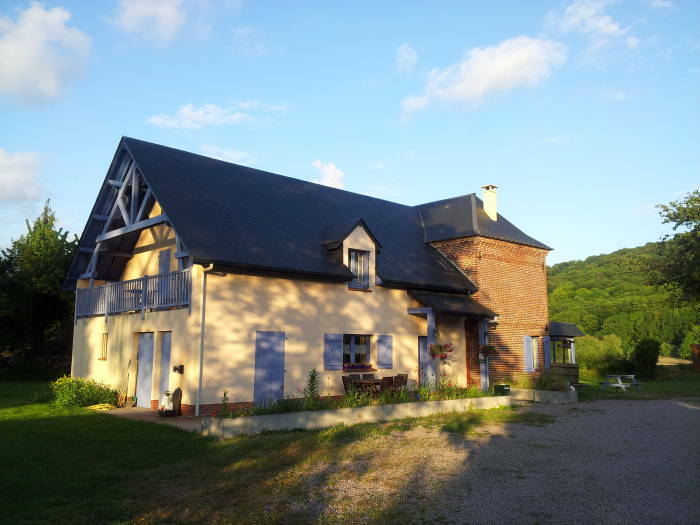 Later we will visit Duclair, and explore and stay overnight in Le Mesnil-sous-Jumièges in the rural area in the south end of this loop. Map of Normandy, US Army map NM31-7 Perry-Castañeda Map Collection at the University of Texas at Austin. The Abbaye du Jumièges or the Jumièges Abbey was founded around 654. The property was donated by the Merovingian king Clovis II and his wife Bathilde. Clovis was King of Neusteria and Burgundy, regions to the northwest and south of the Île-de-France and Paris. Like a figure from a Robert E. Howard story, Bathilde was an Anglo-Saxon aristocrat who had been captured and sold into slavery in Gaul. She had been purchased by Erchinoald, Clovis' maior domūs or majordomo, the manager of the king's household. Erchinoald gave her to Clovis to obtain royal favor. Abbeys and monasteries are quite similar, but a simple explanation is that an abbey is a monastery of higher ecclesiastic rank. A monastery is a building or cluster of buildings containing the workplaces and housing of people following a religious way of life we call monasticism, a term from the Greek μοναχός, derived from μόνος, meaning alone. These could be men or women, monks or nuns, who have removed themselves from the secular world, and they might be Christian, Buddhist, Hindu, or Jain. They might live in a tight-knit community, or they might be isolated hermits. We will visit the Abbaye du Jumièges within this loop of the Seine. 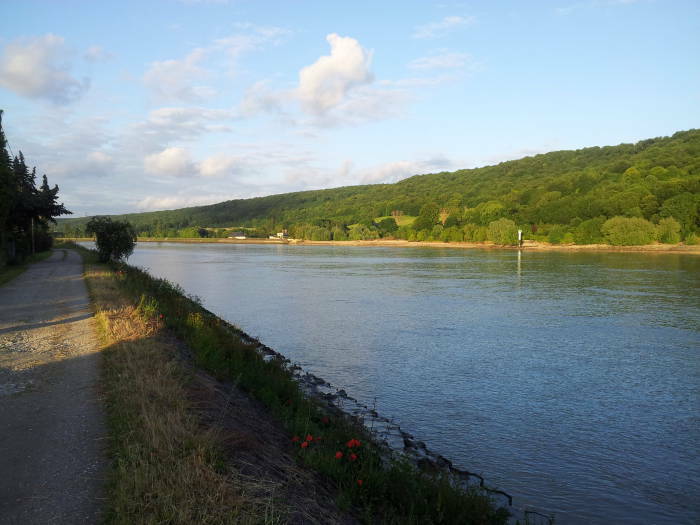 Later we will get dinner in Duclair, and stay at a bed-and-breakfast along the bank of the Seine at the southern tip of this loop or boucle. The boxes with B are the bacs or the cross-Seine ferries, described below. 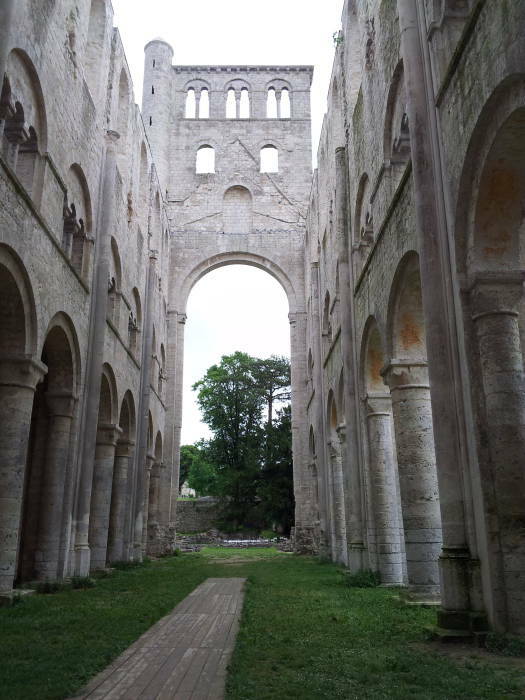 The abbey was turned over to Philibert, who set up a monastic Rule based on that of Columbanus and others. Philibert directed the building of three churches dedicated to the Virgin Mary, Saint Peter, and Saints Germain and Denis. Jumièges became one of the most important literary centers of Neustria and it attracted leading scholars. Philibert had initially assembled about 70 monks. By the year 670 that number had shot up to 800 because they got their monks the old-fashioned way: they bought them. The abbey was buying slaves in England, sending them through catechism, forcibly baptizing them, and at that point some of them became monks. 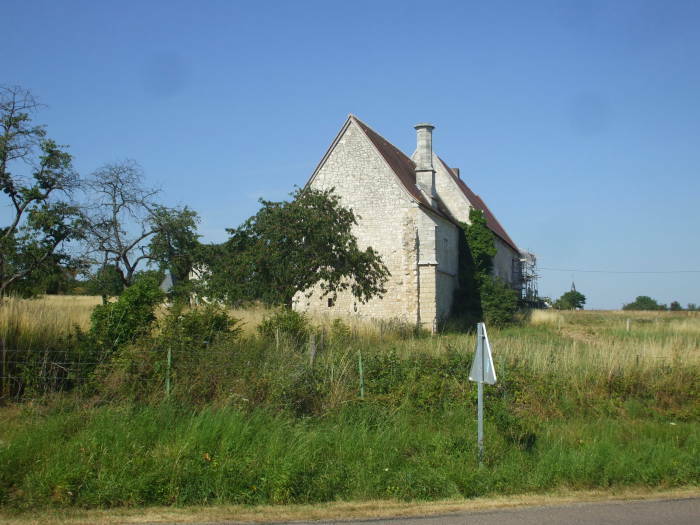 Philibert died, a plague swept through, but still the period 685–700 was a high point of glory and prosperity for Jumièges with about 900 monks plus 1500 servants who cleared the land for gardens, orchards, and vineyards. Tithes were collected to support the poor, and a busy hostel housed English-speaking pilgrims passing through on their way to Rome. Viking is the activity of raiding, and not a group of people. Then the Norsemen arrived on 24 May 841 on a viking raid. The monks took their relics and manuscripts and fled, repeating what their brethren had said at Lindisfarne on the coast of Britain: "A furore Normannorum libera nos Domine!" or "From the fury of the Northmen, free us Lord!" The Norsemen burned the abbey to the ground and then continued upstream to seize Rouen. They later ventured as far upstream as Paris. The French king was Charles III, called Carolus Simplex or Charles the Simple. This episode of getting one group of Norsemen to defend Paris against other Norsemen shows that while Simplex might be translated Simple, that doesn't mean that he was simple-minded. Instead see the alternative translation Charles the Straightforward. The Norsemen eventually mellowed. The French king made a deal with their leader Hrólfr, known in Latin chronicles as Rollo, giving him greater autonomy in Normandy in return for not only leaving Paris alone but protecting it from further raids by other Norse groups. The son of the Norse leader Hrólfr was Vilhjálmr Langaspjót. He was known in French as Guillame Longue-Epée, or in English as William Longsword. William was the second count of Rouen and ruler of Normandy. The Norse were converting to Christianity. Vilhjálmr supported the rebuilding of the abbey on a grander scale. He was assassinated in 942 and buried in the Rouen cathedral along with his father and their descendant Richard Lionheart. Williame I as he was known in Old Norman was the great-great-great-grandson of Rollo, the first Norman leader. He was known as Willelm I in Old English, and known historians speaking 21st century English as William the Conqueror. He led the Norman conquest of England on 14 October 1066 and became the first Norman King of England, ruling from 1066 until his death in 1087. 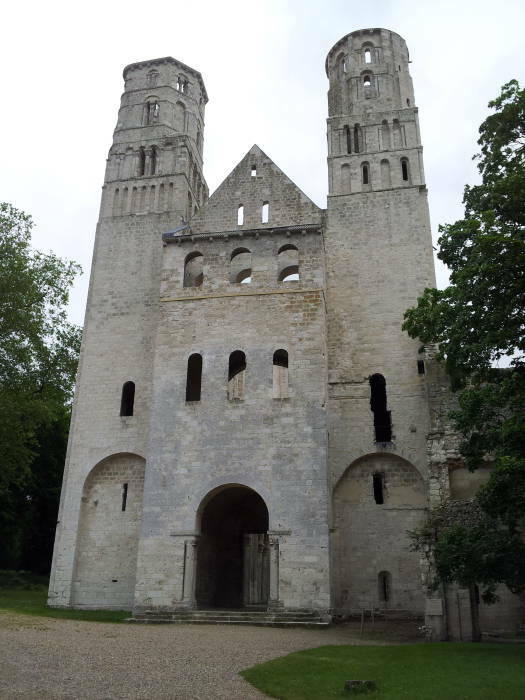 Almost one year after his victory at the Battle of Hastings, William was in Jumièges on 1 July 1067 as the new church of the Abbey of Our Lady of Jumièges was consecrated. 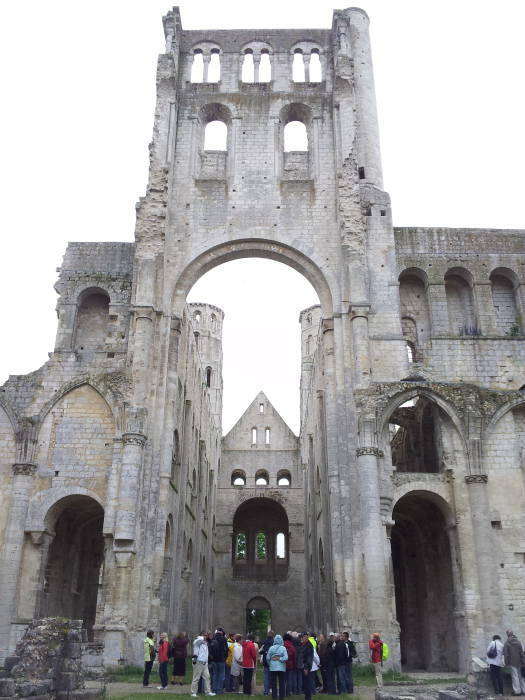 The abbey church was 88 meters in length, and the remaining walls stand 25 meters tall with three levels of arches. The two nearly symmetrical towers are 46 meters tall. The abbey had an impressive array of relics. The cult of Saint Valentine of Terni is documented in 1052, they carried his head in processions. The Jumièges parish church was dedicated to him in the early 13th century. Yes, that Saint Valentine — beheaded in Rome on 14 February 273, associated in the High Middle Ages with courtly love, and now the focus of heavy marketing for the first six weeks of each year. 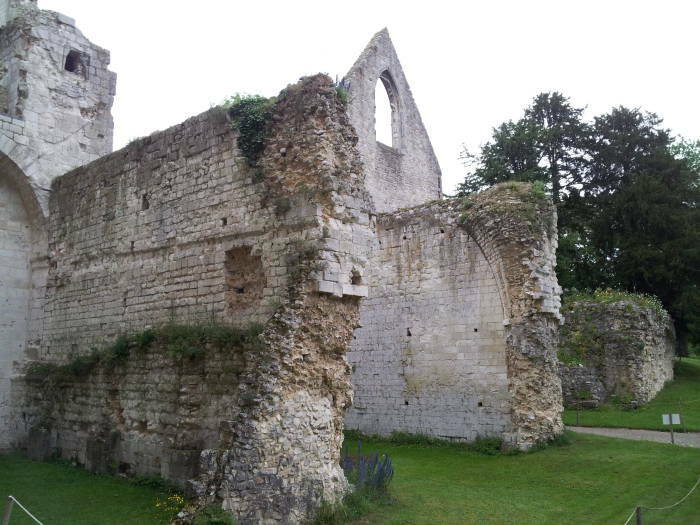 In 1493 the abbey received a rib of Philibert. In 1655, they obtained the skull of Saint Bathilde, the slave-wife member of the founding couple. They had a collection of smaller relics of other saints: a tooth of John the Baptist, a rib of Saint Lawrence, and various bits and pieces of Aicadre, Constantine, Peregrine, Hughes, and Quentin. It's tempting to call such a large structure a cathedral but that would be wrong. The ecclesiastical nomenclature is that a church is a religious facility for the local or neighborhood people. A cathedral is the seat of a bishop. It's literally the "seat." The name comes from the Greek καθέδρα. 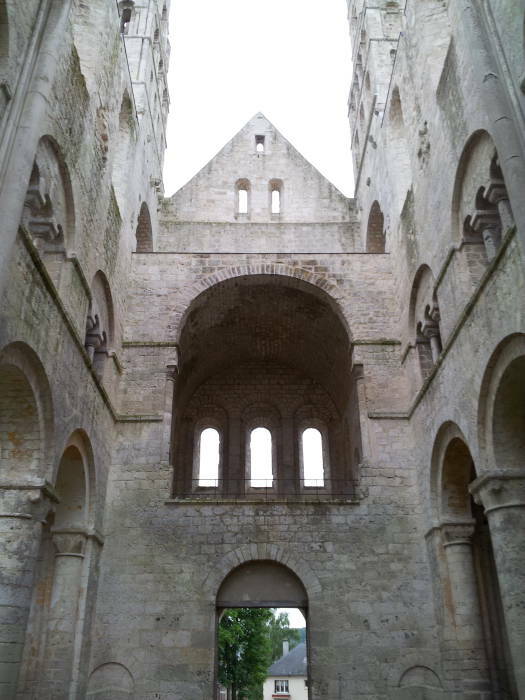 This was a large church for an abbey, a religious community but not the seat of a bishop. So, it's large and elaborate but it's a church and not a cathedral. A true cathedral will contain a special chair or throne for the bishop. Ex cathedra means "from the chair". The bishop will sit in that chair and speak ex cathedra, from the bishop's chair, when there is a formal announcement to be made. A special case of this happens when the Pope, the Bishop of Rome, makes a rather infrequent announcement of formal doctrine for the Roman Catholic church ex cathedra. One example occurred on 18 July 1870 when Pope Pius IX delved into recursion as the Pope solemnly and infallibly declared the solemn doctrine of papal infallibility. Papal statements ex cathedra are uncommon. The only big one since 1870 was when Pope Pius XII defined the Assumption of Mary as an article of faith in 1950. There have been just seven ex cathedra pronouncements since the year 449 AD. A large church is typically built in the shape of a cross. It's laid out so the main entry is at its west end and the long axis runs forward toward the east. The components are named in a mixture of Greek and Latin. 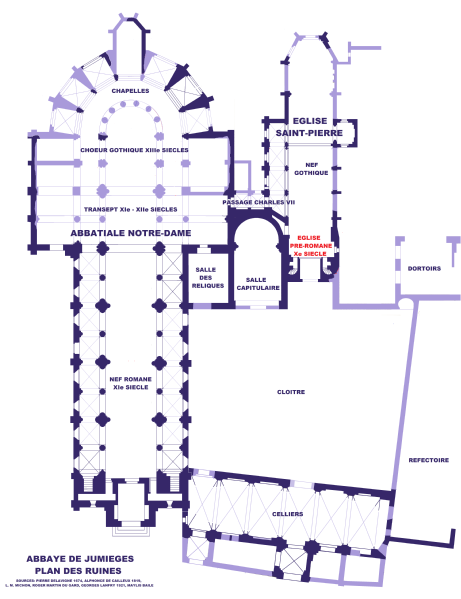 Plan of the Jumièges Abbey, from Wikipedia. You pass through the entry doors in the façade and then possibly pass through a narthex or vestibule. Then you enter the nave, the rectangular area occupying the largest area within the church. The word nave comes from the medieval Latin navis meaning ship. This probably refers to the way the structure's overhead vaulting resembles a ship's keel and ribs. The nave is meant to be a "ship of souls." Some designs intentionally scaled the nave so its dimensions were proportional to those specified for the Jewish Temple in Jerusalem. The crossing is where the north and south transepts or arms of the cross shape intersect the main axis at the front end of the nave. Forward of the crossing is the choir. The development of monasticism provided for singers or clergy to surround the altar located within the true sanctuary space. The multiple churches at Jumièges include the larger Church of Our Lady to the north and the smaller Church of Saint Peter parallel to its south. The Church of Saint Peter was built over the earlier pre-Romanasque church built in the 10th century with the support of Vilhjálmr Langaspjót or William Longsword. Large churches like the Jumièges Church of Our Lady have an ambulatory, literally a walking space, passing around the choir and altar area. Chapels (seven in this design) radiate outward. These features are the result of a construction project in roughly 1267–1278. The choir area in existence then had been built in the simpler Romanesque style. It was rebuilt in the more elaborate Gothic style and more radiating chapels were added. The άψίς or the apse is the semicircular area at the very front end of the church. The apse is typically topped with a hemispherical vault which forms a semi-dome, half a dome or a quarter of a sphere. The πρεσβυτέριος or presbytery is the area around the high altar and is reserved for the clergy. Modern designs usually call this area the chancel. After the doctrine of transubstantiation was introduced in 1215 in another of those infrequent papal ex cathedra pronouncements, the division is that the rector maintains the presbytery or chancel while the parish maintains the nave. In larger churches, especially those of more elaborate French Gothic design like the Church of Our Lady at Jumièges, the chevet is a series of apses or small chapels radiating out from the semicircular arc where the ambulatory circles the apse. The word chevet is French for pillow. The idea is that if the plan of the church is a cross, then Christ's head would lie on the "pillow" of the overall layout. If a church isn't dedicated to the Virgin Mary, then the chevet chapel probably is. Nicolas Le Roux, the Abbot of Jumièges in 1431, played an active part in the trial and execution of Joan of Arc in Rouen. Elements of Eastern Orthodox tradition survive mostly unrecognized in western church practice. For example, the north and south sides of the apse have special significance. The south apse is called the Diaconicon, the Διακονικόν in Greek or Диаконик in Church Slavonic. In English churches this is called the sacristy. It's a chamber where the vestments and books used in the services are stored in cabinets. The north apse is the Προθέσις in Greek or the Протезис or Жертвенник in Church Slavonic. That is, the Prothesis or Zhertvennik. This area contains the small Oblation Table on which the bread and wine are prepared for Divine Liturgy. It was originally just a smaller table placed against the wall to the north of the altar. In the 500s it became a chamber of its own, with a separate apse connecting to the altar area through an arched opening. Large churches typically have two lecterns at either side of the choir area. The Old Testament is read at the one on the south and the New Testament on the north side. This tradition is said to date from when Christianity was limited to southern Europe. Pope Celestine III called for a crusade against the pagans of northern Europe in 1193. Estonia was finally forcibly Christianized in the 13th century. This sequence of scripture readings was once intended to re-enact "bringing the gospel to the pagan north." Of course, forcible crusades often fail to bring the desired results. Estonia is now one of the least religious countries in Europe, even less religious than the Netherlands. The explanation that makes sense to me based on what I've seen is that up through the late 1800s religion was part of the heavily oppressive Germanic feudal rule of Estonia. Almost immediately after that the Estonians fell under the control of the Russians. That soon brought forced inclusion in the Soviet Union, when religion became something for which you were punished. Given their history over the past few centuries, in which religion was a source or cause of suppression, I would be surprised if the Estonians were religious at all. And on the topic of religion gone wrong, in 1562 the Huguenot armies had ravaged Rouen, Dieppe, Le Havre, and Coudebec on their way to Jumièges. The monks had fled Jumièges after learning about the sacking of Coudebec. The Huguenots arrived to find an abandoned monastery ready for destruction and plundering. The Huguenots turned over the altars, stole the sacred vessels, destroyed the shrines, and broke and burned the images and relics. Smaller portable objects like ornaments, linens, silverware, and furniture were all stolen. Then they moved on to structural components and supplies. The lead roofs, tin and copper fixtures and flashing, wine, wheat, and cattle were all stolen. Then they continued to the library and archives and stole all the books. Only seventeen religious staff returned to Jumièges after the Huguenot sacking. In the early 17th century the leader tried introducing a different religious rule, but that didn't revive the life of the monastery. The abbey dwindled through the 18th century. The abbots tried to increase their personal profits, and the number of monks continued to drop. There were still no more than eighteen religious personnel at Jumièges in 1789, and they were dispersed in 1790. 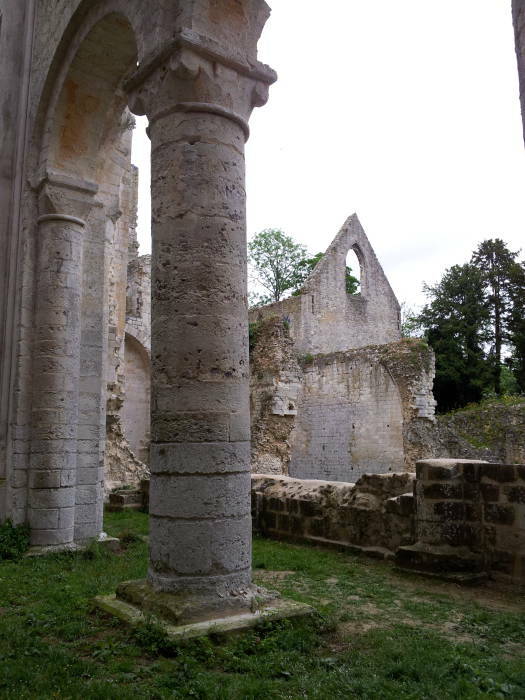 The abbey was a victim of the French Revolution like many religious institutions. It was sold as an asset of the state. In 1795 its purchaser began demolishing the convent of the 16th and 18th century dormitory. 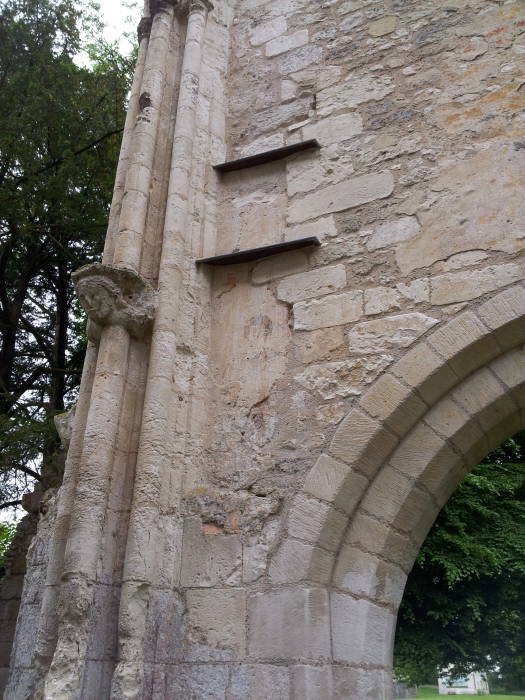 The abbey changed hands, and in 1802 the new owner blew up the choir to use the resulting piles of cut stones. There was more "stone quarrying", disassembly of the ruins to use its cut stone blocks, continuing through 1824. 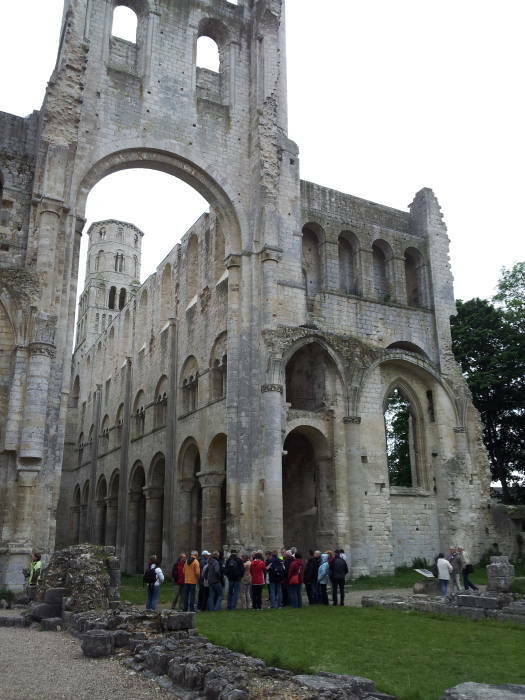 After that the abbey passed through the hands of some families who saved it from complete destruction. Victor Hugo was urging that it be preserved when the Lepel-Cointet family bought the abbey in 1852 and began to save the ruins. It was first officially classified as a historic monument in 1862. 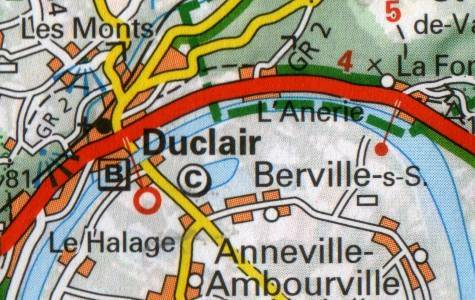 Duclair is on the north bank of the Seine between the Saint George Abbey of Boscherville and Jumièges Abbey. Provincial road 982 (former road 182) passes through. There was a church and a monastery here in 671. 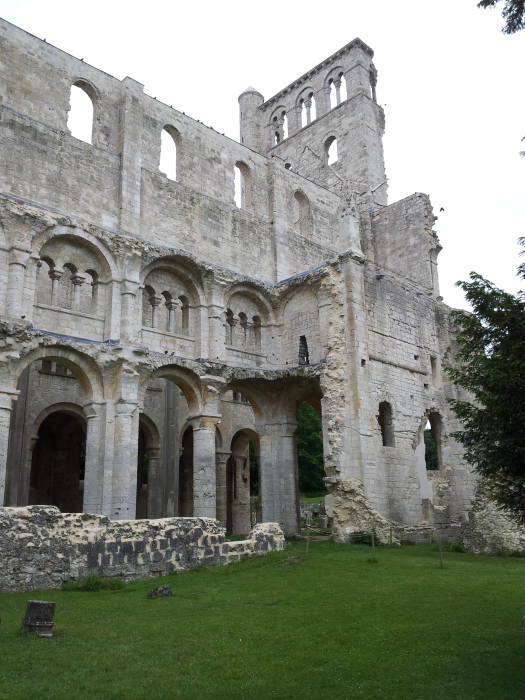 The abbey was destroyed by the Normans in the 800s. The town was referred to as the parish of Duroclarus in 811. 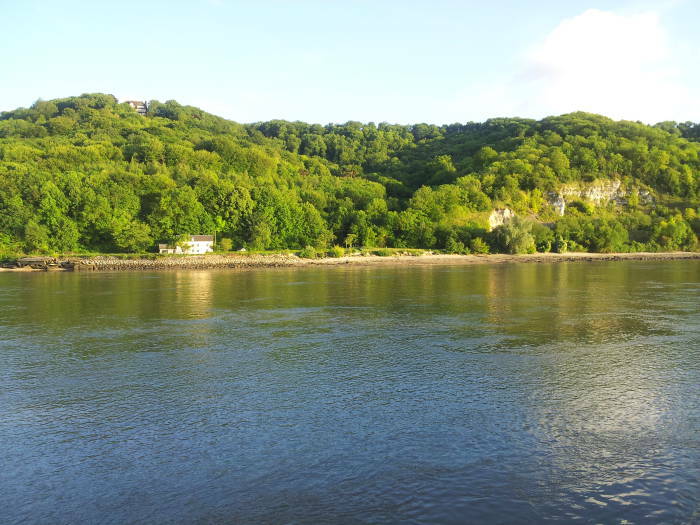 The Gauls were in the habit of whitewashing the wooden palisades around their settlements. That's why the parish was called Duroclarus. The Gallic duros means "fortress" and the Latin clarus means "clear." That was an old name even in the early 9th century. In the 11th century, the plague swept through and Saint-Denis church was built with its triple nave. The bell tower is from the 12th century, the portal is Renaissance. The stained glass is from the 15th and 16th century. The baron of Duclair was one of the prominent Norman warriors recorded as being in the Norman forces at the Battle of Hastings in 1066. The town was occupied by the English in 1360 during the Hundred Years' War. Another plague came through in 1479. Duclair had a regionally important brewery in the 15th and 16th centuries. Water wasn't generally safe then. There was a leprosarium above the town at Mont Davilette before the Revolution. There was no bridge across the lower Seine below Rouen until the large Tancarville Bridge was completed in 1959. 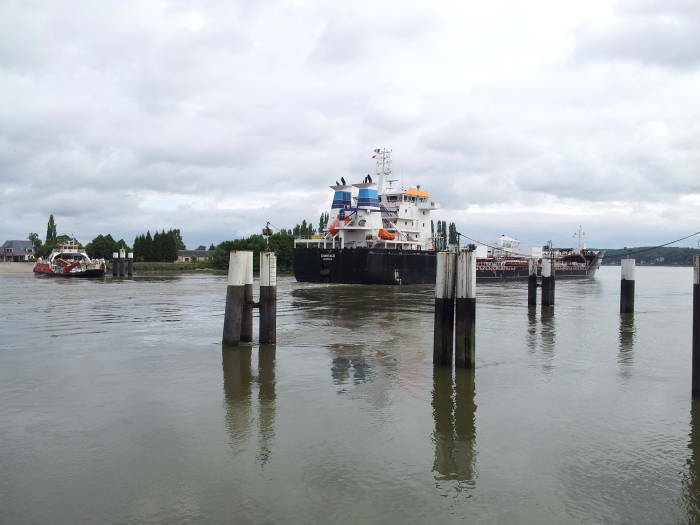 Sea-going vessels require 50 meters clearance underneath bridges. The Tancarville Bridge is 50.85 meters above the typical water level, with a 608-meter cable-suspended center span between towers 123 meters tall. A series of bacs or ferries cross the Seine between Rouen and Le Havre. See B on the map. 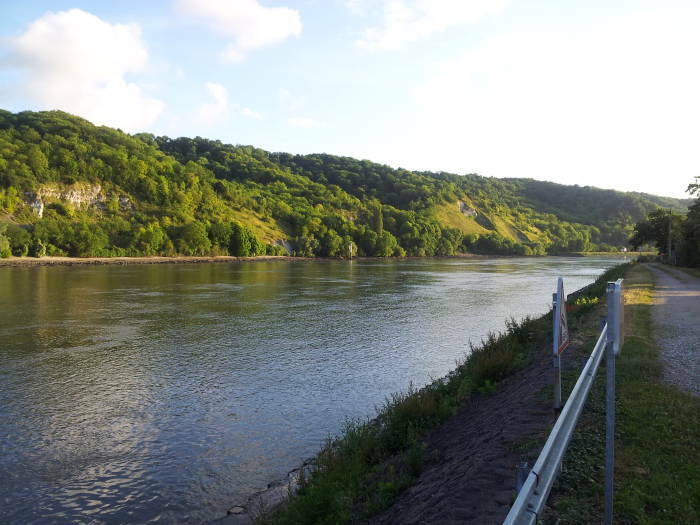 There are four ferries crossings around the loop from Duclair to Jumièges. There are eight ferry crossings and they carry 10 million passengers per year. The Duclair ferry was converted to steam power in 1872, it has been diesel for a long time. The current bacs are flat-bottomed boats with no specific bow or stern, they cross back and forth without turning. 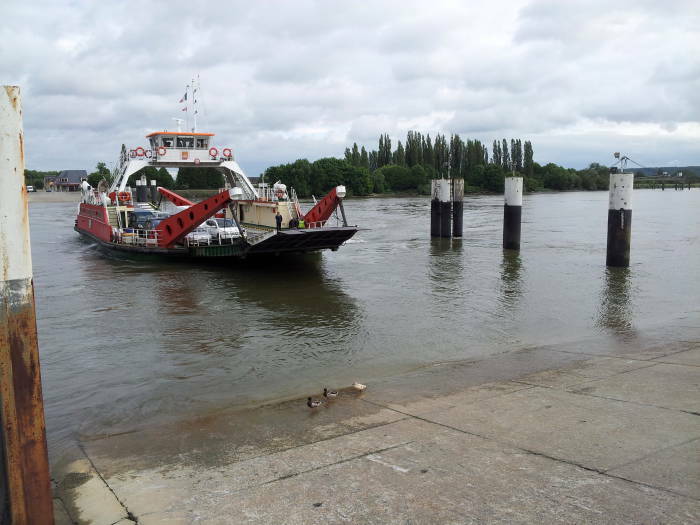 The ferries are operated by the département of Seine-Maritime. 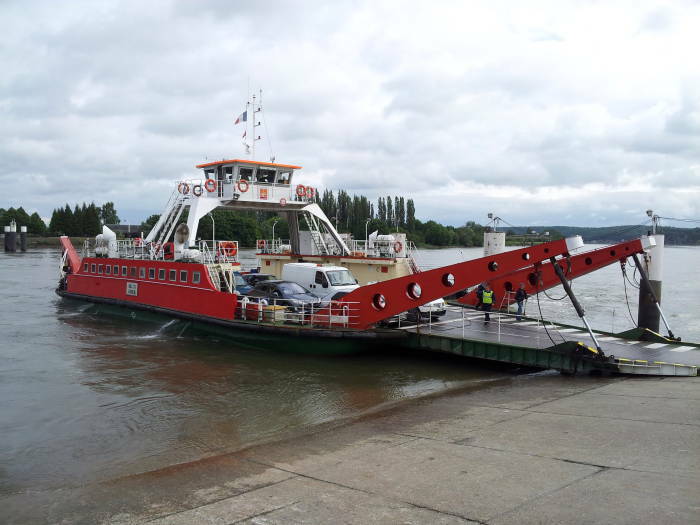 Larger ferries operate here at Duclair—Berville and also at Quillefeuf—Port Jérome. These can carry three to four heavyweight trucks in addition to automobiles. In late August 1944 there were tens of thousands of German soldiers on the southwest bank of the Seine trying to flee the advancing Allies. Aircraft and artillery pounded the German troops on the river bank and this led to significant losses of men and material. The English and Canadian armies fought the last bastions of German defense and finally liberated the civilian population. 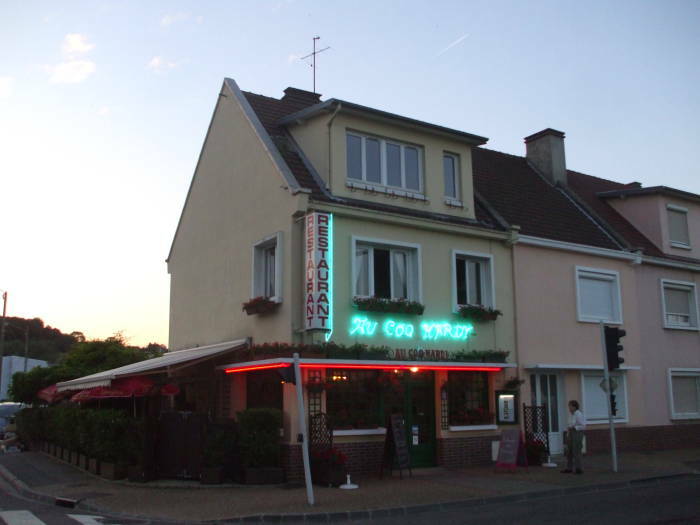 There are a few places to get dinner in Duclair. Le Coq Hardy is the best. It is along the D 982 road where it runs through Duclair along the waterfront. 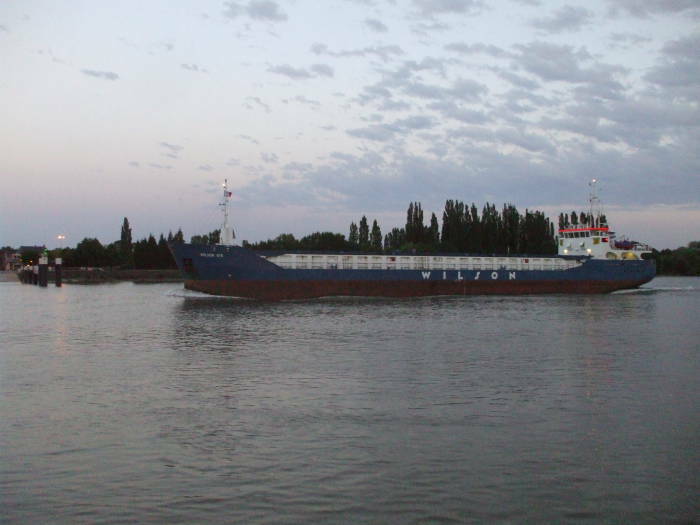 There goes another ocean-going cargo ship upstream along the Seine to the Port of Rouen. The entire area contained within the southern loop (or boucle or méandre) of the Seine is Le Mesnil, and the community within the loop is specifically called Le Mesnil-sous-Jumièges. That is, Le Mesnil under Jumièges. 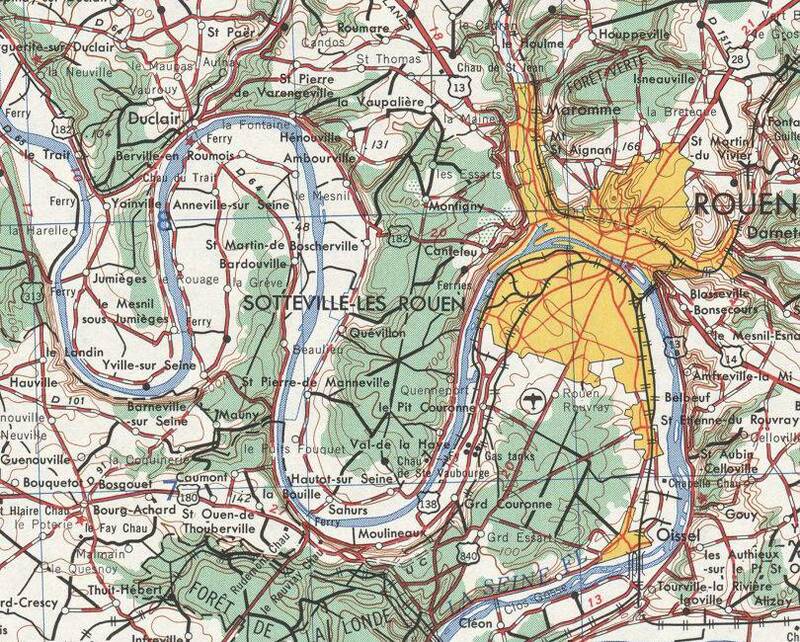 That could be "down south" and below Jumièges on the map drawn with north at the top. Or, more likely, "below" in the sense of "subservient to", or under the control of the Abbaye du Jumièges. 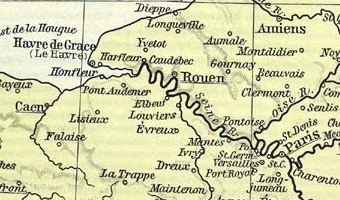 The town of Masnille was mentioned in records in 1147. Le Mesnil-sous-Jumièges is now a commune or community of a little over 600 inhabitants mostly involved in agriculture. The loop is rural, with most of the land covered in fruit trees — apples, pears, cherries, plums, and others. The road looping through Le Mesnil is sometimes called the Fruit Road. Charles VI became king when he was just 11, and four uncles who were Dukes controlled the government. The four uncles fought among themselves, spent the nation's funds for their own enrichment, and kept Charles out of power until he was 21, seven years after the traditional royal age of majority. Charles was finally able to dismiss his uncles, take control, and restore his father's former advisers. Economic and political conditions improved over the next four years and he became known as Charles le Bien-Aimé, the Beloved. But then one day he suddenly went mad. He killed four knights and nearly killed his brother. Episodes of insanity became increasingly frequent and longer-lasting. He would attack his servants, run until he fell from exhaustion because he thought that enemies were chasing him, and suffer strange delusions such as believing that he was made of glass. Now he was Charles le Fou, the Madman. Other royal family members tried to take power away from him, and the situation degenerated into a civil war. This was in addition to the ongoing Hundred Years' War. There were assassinations, deals with the English King Henry V, and finally the 1420 Treaty of Troyes in which the French King Charles VI the Mad disinherited his own children, married his daughter off to the English King Henry V (see Shakespeare's Henry V and any of the movies based on it), and named Henry as the successor to the English throne. Charles VII inherited the throne of France two years later in 1422. France was in a real mess. The forces of the Kingdom of England and the Duchy of Burgundy occupied Normandy and northern France. The occupation included Paris and the city of Reims, where French kings were traditionally crowned. His court was based in Bourges, south of the Loire river in Cher département. The area around that city was one of the last areas still under French royal control. Things turned around with the military help of Joan of Arc who led French troops to lift the siege of Orléans and then recaptured other strategic cities along the Loire river. After the decisive defeat of English forces at the Battle of Patay, just north of Orléans, the people of Reims switched to the now-winning French side. This allowed Charles VII to be officially crowned the King of France in the traditional way in 1429 at Reims Cathedral. Agnès Sorel was the favorite mistress of King Charles VII of France. Royal marriages through the Middle Ages were usually political. Charles' wife was Marie of Anjou, the eldest daughter of Louis II of Anjou, who claimed the titles of King of Naples and King of Sicily, and Yoland of Aragon, who claimed the title of Queen of Aragon. It was common for kings to maintain one or more mistresses, sometimes referred to as favorites. Charles had other mistresses, but Agnès Sorel was his favorite favorite. Agnès was born about 1422 into a family that had been in the nobility for several generations. She was educated in the ways of the nobility, and she lived for a while in the castle of Maignelay-Montigny where she could be a court companion of Isabells, the Duchess of Lorraine, Queen of Sicily, and wife of René, the brother of King Charles VII. She met Charles in 1443 in either Saumur or Toulouse. She was about 21, he was about 40. Agnès became the lady-in-waiting for Marie d'Anjou, Charles' wife, and then became Charles' mistress. In late 1444 she appeared at his jousting tournament as the Maîtresse-en-Titre, the Official Royal Mistress. Up to that time mistresses had been an open secret maintained outside public view. Charles didn't care. Besides, having an Official Royal Mistress was certainly an improvement over his father's killing sprees and vitreous delusions. The office of Maîtresse-en-Titre persisted through the end of the reign of Louis XV in 1774. 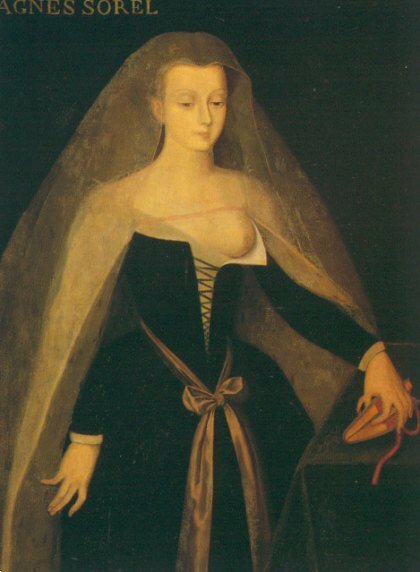 16th century painting of Agnès Sorel, from Wikipedia. Charles spent lavish amounts on her clothing and jewelry, and gave her properties in several cities. He gave her the Château de Loches in Chinon for her official residence. 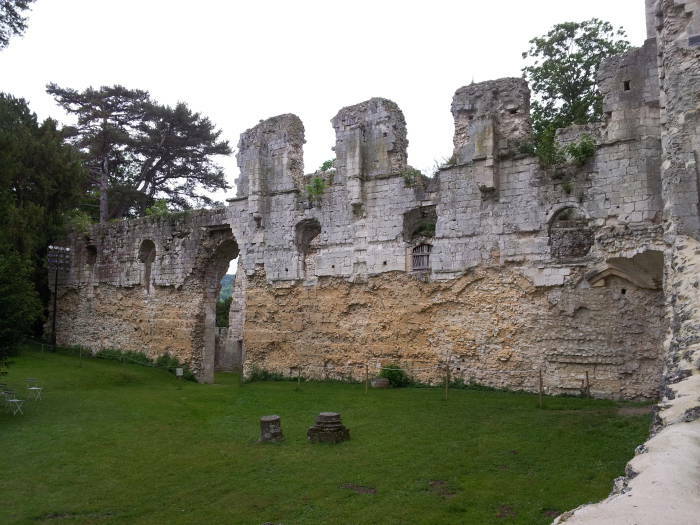 This was the castle where Joan of Arc had convinced Charles to be crowned King of France. Agnès' increasingly low-cut tops led to her establishing the style of one completely bared breast and made her quite popular at parties. The Dauphin, who later became King Louis XI, was openly opposed to Agnès because of his father's favor of her over Marie d'Anjou, Charles' wife and the Dauphin's mother. He once drew his sword and chased Agnès through the palace and into his father's bedroom. Meanwhile Agnès had given birth to three girls who were Royal Bastards but came to be recognized as French princesses and married to noblemen. 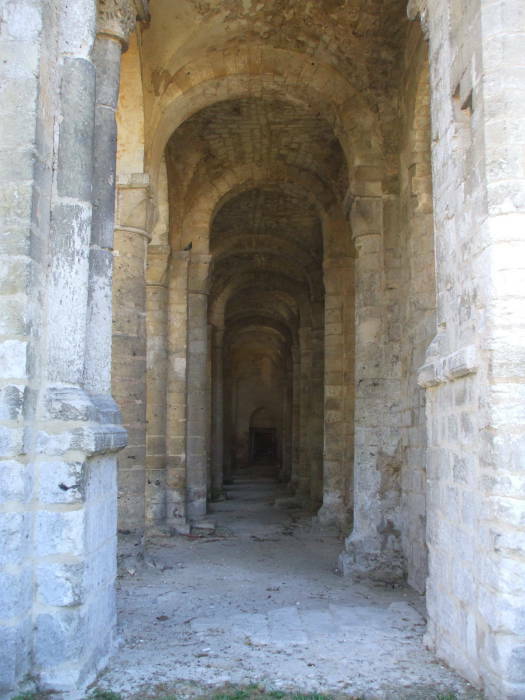 During the reconquest of Normandy toward the end of the Hundred Years' War, Charles made his 1449–1450 winter quarters in the Jumièges Abbey. Agnès was pregnant with their fourth child when she traveled from Chinon to provide moral support to Charles. She arrived in early January and was installed in the Manoir de la Vigne, a 13th century manor house along today's D 65 road. The official French court chronicler recorded that a "stomach flow" suddenly started and then she died within hours. Her baby was born prematurely and died soon. The official explanation was dysentery, but suspicions of poisoning were immediate and long-lasting. "The art of Kanly is still alive," as they say. The Dauphin was the first of several suspects, as he had been openly opposing his father for the past four years and he might have poisoned her to end her influence over the king. 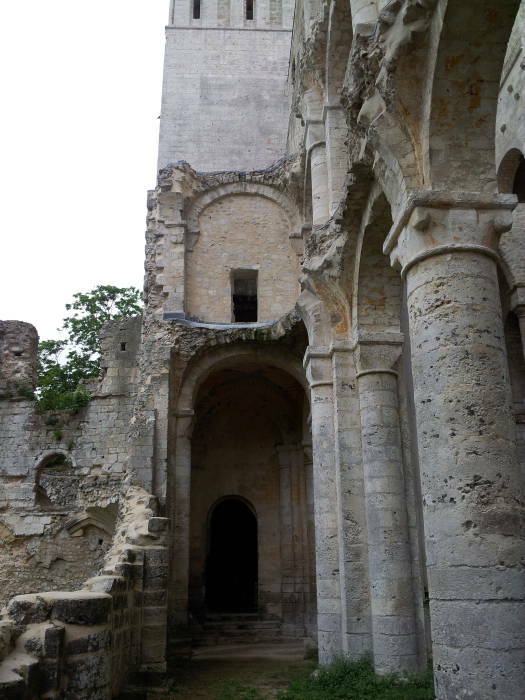 Agnès' heart was buried in Jumièges Abbey, the rest of her in Loches in the Church of Saint Ours. Her cousin Antoinette de Maignelais took her place as Maîtresse-en-Titre. Life goes on. When her remains were relocated in 2005, an analysis found signs of roundworm in the gut plus high levels of mercury. Deliberate poisoning by mercury? Perhaps. Mercury was used to treat roundworm infections, and absorbed into bread and eaten to treat heartburn. However, the mercury levels found in her remains were much higher than the usual therapeutic doses. Mercury was also used in cosmetics. She used a lot, but not that much. After the Battle of Castillon in 1453, the French had recaptured all continental possessions of England except for an area around Calais. The rest of Charles' reign up to his death in July 1461 was filled with conflicts with his son. 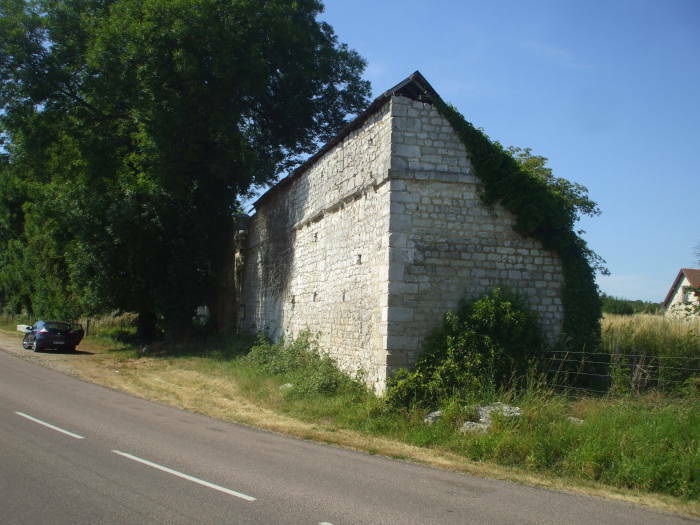 Below is the 13th century Manoir de la Vigne along today's D 65 road. This is where Agnès Sorel briefly lived and then died in 1450. 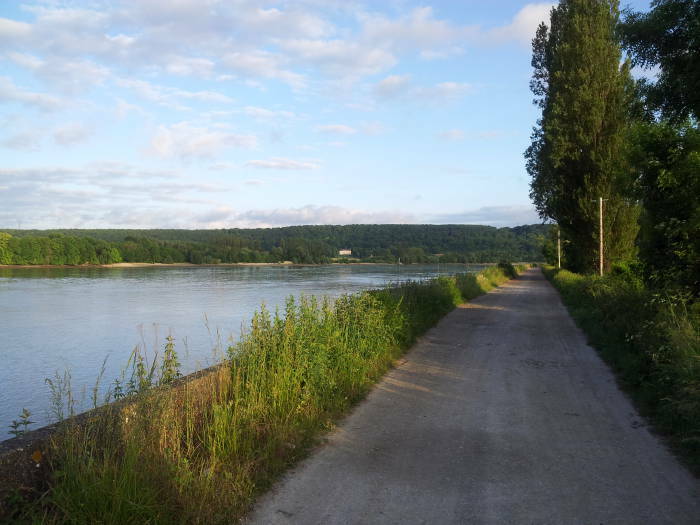 We will continue along the narrow riverbank road around the southern tip of Le Mesnil-sous-Jumièges. 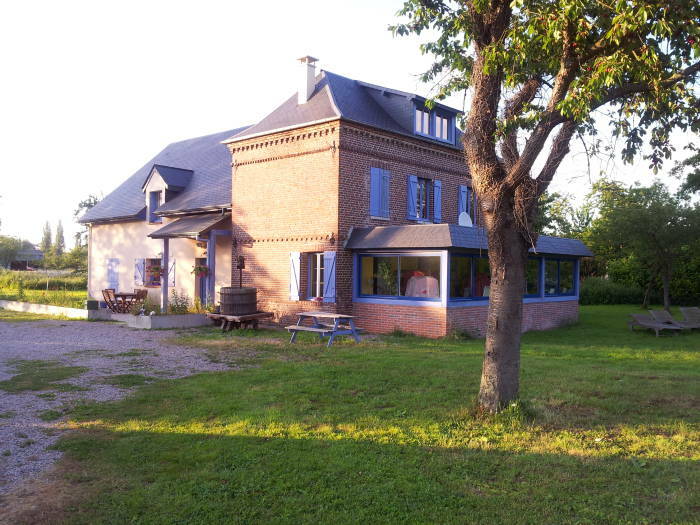 We stayed at Le Relais du Passage de la Roche, a bed and breakfast on the riverbank at the southern tip.